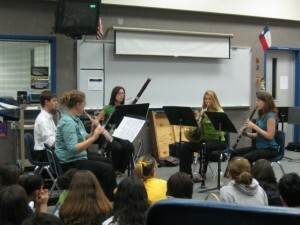 The Madera Wind Quintet recently performed for FHMS in Keller. The critically acclaimed Madera Wind Quintet will perform at Southwestern Adventist University on Tuesday, Jan. 18 at 7 p.m. in Wharton Auditorium. The Madera Wind Quintet was established in the fall of 2008 by students and alumni of the University of North Texas. Based in Denton, Texas, Madera performs a variety of quintet literature, including standards of the genre as well as new works. Also committed to educating students about chamber music, the Madera Wind Quintet has performed and taught master classes in area schools. The quintet includes members who are on faculty at Texas Woman’s University and Southeastern Oklahoma State University. Those interested can hear recordings from the Quintet on their website.